Printing Peach designed a website for me that is both attractive and easy for my customers to maneuver through. New customers came almost immediately. The staff is very helpful and takes the time to explain things to this not so net savvy customer! Evan, I just wanted to make sure that you knew how much I appreciated your work on the new website. Your clarity in communication and understanding of my needs were tremendous. Hi Jonathan. I just wanted to tell you that the flyers look fabulous. They are so professional looking. We expected something one would mass mail but these are exceptional. Thanks so much for sending our flyers out to such a great printer. How much would it cost us to do letterhead? The cards arrived today, and they look great! Thanks to everyone at Printing Peach who helped out. You all did an awesome job and I appreciate every bit of it. Thanks again and I look forward to coming back to you services in the future! Thanks for all the work you did on the revisions I really appreciate it. If you ever need a referral feel free to give my # as satisfied client. If you would like to use any of our projects as examples you’re more than welcome to as well. Thank you so much for all your help! The output of your work, as well as your customer service has been phenomenal. I wanted to send a quick note of thanks to both of you, following my receipt of the business cards I had ordered from Printing Peach yesterday in the mail. The finished product far exceeded my expectations; I was truly thrilled. I will certainly be using your company for any other printing needs that arise within our organization, and would be happy to refer our affiliates to you. Thank you. We received the cards today. They look fantastic. I just wanted to pass along a HUGE thank you to all of you. I just picked up my cards last night and I am absolutely blown away at how beautiful they are. The quality is fantastic, my interactions with all three of you when I needed you were nothing short of wonderful, and I am greatly indebted to you for giving me such a fast turn around time at the holidays – and all of this with very competitive pricing. Thank you so much – We will surely order from you again. Jonathan…we already received our packages on Friday afternoon – surprise!! The cards are absolutely wonderful! They arrived this morning just after I had my coffee and I clipped them on my letters and made the 4pm mailout….. I am very impressed with the professionalism at Printing Peach. Yes there was a mistake, but these things happen from time to time. It was handled excellently – this experience has not turned me off, but in fact the opposite when knowing the way things are done at your company. I sincerely appreciate your efforts and look forward to working with you in the future. Enjoy the long weekend! I have received everything and I will be ordering from you guys again! I just like to say the postcards were perfect thanks again. Hi Jonathan. Yes I received my order, the postcards look great. Thank your team for all their help and patience. all our post cards look great. Hi, I just wanted to let you know that I just received my order. You are superior in service and I will definetly be placing more orders in the future. My questions were answered promptly and your method of ordering is fantastic. The finished product is just as you said it would be and your shipping was quick. Thank you so much and I look forward to doing more business with you in the future. I would like to say a Big Thank You for the quick turnaround in receiving my products. The order was placed and received in a timely manner (within a matter of 4days). I’ll definitely be using your company again and recommending to others. Just to let you know the brochures are OK. Nice job !!! Well, I do have a comment which is that it has been a pleasure!! I contacted a few busy ‘local’ shops that compared on pricing but they were making me jump through some major hoops just to get a simple business card. You guys made it easy and really delivered. The cards look fantastic and arrived in time to take to a trade show. Thank you. I will have another order for you shortly for someone I hired. Cheers! I received my order today and I just wanted to say that they look great. Beautiful job! Oh, and the price was great, I had a number of other quotations and one said they would match or beat any price, when I told them your price they said to print with you. Again, great job and I look forward to working with you again. Seven boxes arrived earlier today.Â The material looks good – nice job. Just wanted to thank you for your involvment with printingÂ my brochures,they are fantastic! I will recommend you to my co-workers for sure. Fit 4 TwoÂ® Pre and Postnatal Fitness Inc. I just got my bussiness cards and I love them, so much better than my old ones. I’m very pleased with the outcome of my printing job. I received the business cards tonight. Very fast turn around, and the cards are exactly what I had hoped for. Good Job! I wanted to let you know how happy we are with the door hangers! The process ran very smoothly and the quality of the product is excellent. Thank you for your patience and promptness in “getting it right”. I have no hesitation either in recommending you to others, or using your services in the future should the opportunity arise. Thank you so much!! You have been a great help!! 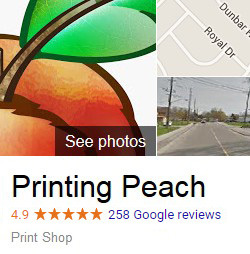 Thanks for making this first experience with Printing Peach a pleasant one! Just a quick note to inform you that we received the pocket folders this morning. They look great! Thank you for your prompt service and communication. I received the cards and I’m very happy with the results. Thank you very much for all your help and patience. I will definitely return and recommend your services in the future. The business cards turned out top-notch. I’m very grateful for all your help and extremely pleased with the final product. I’ll definitely spread the word about your services. Thanks again! I wanted to drop you a line and thank you for the order we just received. The cards are perfect. We have been ordering this type of postcard from California and putting up with second rate quality and delivery. It really impressed us to get incredible quality, on time delivery â€“ and from a Canadian supplier. Thanks a lot, we appreciate the service we received. Thank you so much for your efficiency with our brochures and the beautiful web site! They both look great! Just wanted to let you know what a fabulous job I felt you did on my design! The quality of the postcards is really, really great and I will not go anywhere else! I got my cards today, and wow! The quality is incredible compared to my old cards. You said they would be good but I was skeptical. Not anymore. I’ll spread the word. I don’t know if you get this a lot, but wow! What a great job you have done. Everything looks just great and the price was by far the best. Talk to you soon. As a realtor I was looking to work with an Agency who could provide me with print media as well as a website in order to be consistent with my branding. The guys at Printing Peach are VERY gifted at taking my words and quickly turning it into a reality. They continually astound me with how well they can translate my vision into an product/image. Their customer service skills are excellent; always responding to my needs promptly. I would definitely recommend their services to people looking for cutting edge ideas and excellent service.